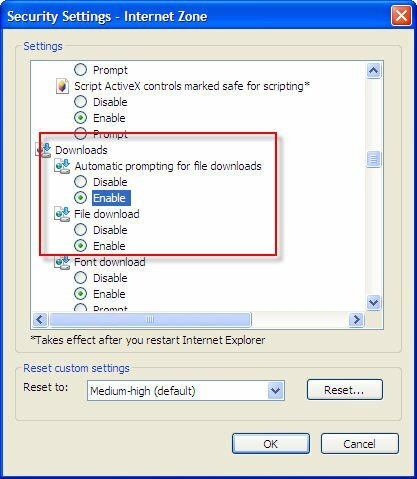 Because of recent security changes in Internet Explorer 7, these settings are required for exporting reports in IE7. From the [Tools] menu – top right on IE7 – select [Internet Options]. Select the [Internet Zone] (click the globe on the left). Scroll down to the [Downloads] section and find the [Automatic prompting -for file downloads] setting and set it to [Enable], then click on [OK].